Home appreciation is generally considered a good thing. It means more equity for homeowners, and a bigger payout when the time comes to sell. But as we learned during the financial crisis, when home values grow too quickly, a boom can quickly turn into a bust. That can lead to vanishing equity, underwater mortgages, foreclosures and a lot of unwanted stress for everyone who owns a home. This is the 2015 version of SmartAsset’s study. Read the 2016 version here. For that reason, most homeowners would probably prefer moderate, steady price growth to the up and down cycles that characterize some markets. Housing market stability isn’t only good for financial health, it’s good for a homeowner’s mental health too. So which cities have historically had the most stable growth in their housing markets? To find the U.S. housing markets with the most stable growth, SmartAsset analyzed home price data from the Federal Housing Finance Agency on the 358 largest urban markets. We looked at home prices for each of these areas going back to 1990. For each market, SmartAsset first calculated the overall growth since the first quarter of 1990. These ranged from as high as 320% (in Casper, Wyoming) to as low as 27% (in East Stroudsburg, Pennsylvania). We then calculated the probability over that same period of time that a homeowner would have experienced significant price declines (5% or more) at any point in the 10 years following his or her home purchase. Try SmartAsset’s super-smart mortgage calculator. Next, we computed a score for each of these metrics. A city with growth of 250% or higher since 1990 scored a 100 for that metric, while a city with 0% growth would score a zero. Every other city got scored somewhere in between, relative to the highest and lowest cities. Likewise, a city with a 0% historical probability of significant price declines would score a 100 for that metric, while any city with 58% odds of significant price declines (the highest possible in our study) scored a zero. Lastly, we averaged the scores for overall growth and long-term stability to find the housing markets with the most stable growth. 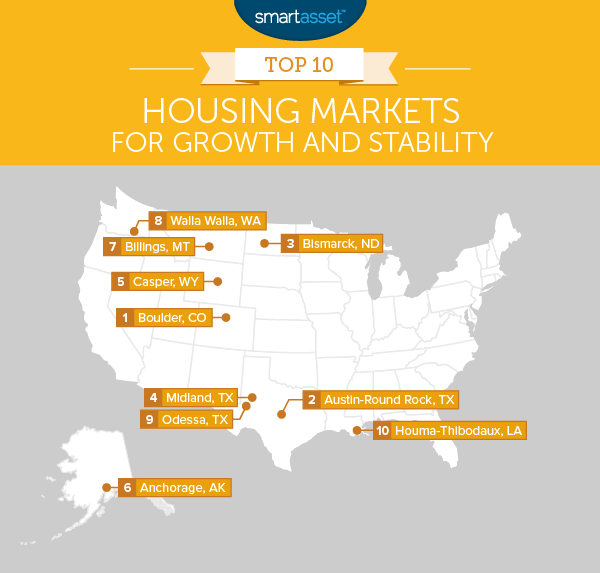 Five of the top ten housing markets with the most stable growth over the past 25 years are located in the west. These cities – one each in Colorado, Wyoming, Alaska, Montana and Washington State – have all had overall growth north of 200% and very few dips in home prices. 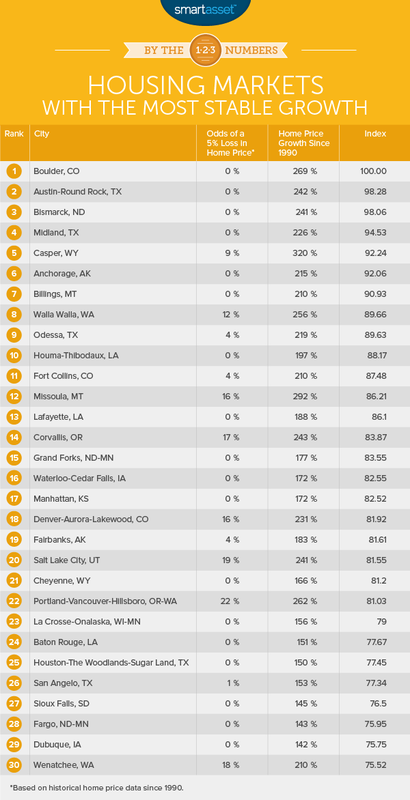 The Lone Star state also fared well, with three of the top ten cities. The state capital, Austin, placed second overall, with a 242% total growth rate since 1990. Texas is known as a relatively homeowner-friendly state because of its low closing costs and light zoning regulations. Over the past 25 years, home prices have grown an average of 4% a year in Boulder and are approaching a price level nearly quadruple that of 1990. During that time, home prices have never once seen a decline of more than 5% in Boulder – not even during the national foreclosure crisis. 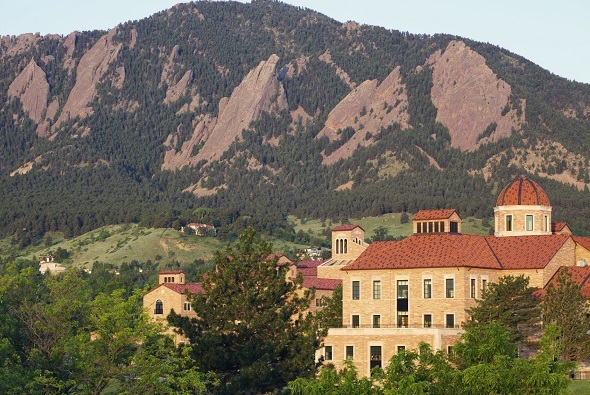 That stability means homeowners in Boulder have been spared the stress of a plummeting market, while still reaping the benefits of price appreciation. The Austin housing market is among the hottest in the country, but unlike many other hot markets, Austin isn’t recovering from a major bust. While many cities such as San Jose and Seattle saw price declines of over 10% during the housing crisis, in Austin prices declined by just 3.4% in that time. Those relatively minor declines were more than compensated for during the rest of the past two and a half decades. According to data from the FHFA, home prices in Austin have climbed 242% since 1990. North Dakota’s economy has consistently been among the strongest in the country over the past three decades. The state’s current seasonally-adjusted unemployment rate is just 2.6%. That economic stability also helps lead to stability in the housing market. Even during hard times, housing demand stays strong, foreclosures are low and price declines are minor and short lived. The average homeowner who bought a Bismarck house at any point in the past 25 years never experienced price declines of 5% or greater. This West Texas city has had among the highest overall growth rates in its housing market over the past 25 years, with prices increasing by an average of 3.3% annually. While the city’s economy has historically been driven by the local oil industry, in recent years that hasn’t led to the booms and busts typical of many oil towns. There have been zero periods of significant price declines in Midland since 1990. The second largest city in Wyoming, Casper’s economy has expanded in recent decades as the region’s coal and uranium fields have been developed. Likewise, the city’s population has grown significantly over the past 30 years. That combination of economic and population growth have led to the highest average home appreciation of any U.S. city over the past 25 years. Home prices in Casper have increased 320% since 1990, an average of 4.7% annually. The largest city in the Last Frontier has remained largely untouched by the housing market swings that have affected much of the lower 48 states over the past two and a half decades. While the city has seen annual average growth of over 3% since 1990, it has not suffered any significant price declines over that same period. That, in general, means more equity and less stress for Anchorage homeowners. Related Article: What is the True Cost of Living in Alaska? Even during the recession of the last decade, the economy in Montana’s largest city never really faltered. The unemployment rate in Billings never exceeded 7%. With most people in the city retaining their jobs, foreclosure rates remained relatively low and the housing market in Billings saw relatively minimal price declines. On average, homeowners in Billings had 0% odds of seeing their home value decline by 5% if they bought at any point in the last 25 years. Walla Walla is located in the southeast corner of Washington State, in one of the state’s most productive winemaking regions. Growth in the local winemaking industry has bolstered the economy in recent years and sent the housing market to new heights. Home prices have grown nearly 30% since the start of 2005, despite temporary losses during the housing crisis. In fact, Walla Walla’s overall growth rate of 256% since 1990 ranks as the 5th highest of the 358 markets in SmartAsset’s study. On average, a homeowner buying in Odessa over the past 25 years has faced just 4% odds of seeing price declines of 5% or greater. Compare that to cities like Las Vegas and Atlanta, where the odds of such declines since 1990 were 41% and 39%, respectively. But it isn’t just stability in Odessa’s housing market. Home prices have consistently increased there as well. Price levels today are more than triple what they were in 1990. Home prices in the Houma-Thibodaux region have grown nearly uninterrupted since 1990. In fact, despite the multiple setbacks of Hurricane Katrina and the recession, home prices declined by just 2.5% from their peak at the beginning of the crisis to their low point. That, combined with average annual price growth of 2.8% make the Houma-Thibodaux market one of the top 10 markets with the most stable housing growth. Read the 2016 version of SmartAsset’s study on the U.S. housing markets with the most stable growth.